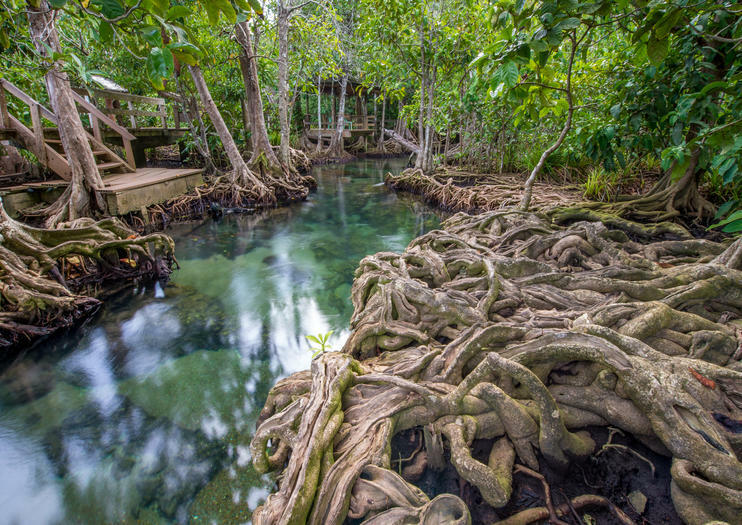 Pa Phru Tha Pom Khlong Song Nam -- it’s a mouthful that in English means “canal of two waters” – is a stunning natural paradise where crystal-clear freshwater springs meet saltwater mangrove forests. Located about 21 miles (34 kilometers) outside of the town of Krabi, Pa Phru Tha Pom Khlong Song Nam is lined with boardwalks, making it a photogenic place for nature walks beside and above the water. Wooden chairs placed throughout give guests a spot to stop and admire the views. One of the best ways to experience the natural beauty of the area is in a canoe. Rentals are available by the hour or the day, and from the park entrance, you can paddle all the way to the Andaman Sea. Give yourself about an hour to wander the boardwalks or canoe through the canals. The park is open year round, but the waters are at their clearest during periods of low tide. Paddle through sea caves on a full-day kayaking adventure at Bor Thor. Explore cave paintings, artifacts, and archaeological treasures while following your knowledgeable guide across rivers and inlets into limestone caverns. Enjoy a seafood lunch and a swim at Tha Pom where seawater and freshwater meet. Round-trip transport is provided from Krabi. Numbers are limited to ensure a small-group experience. Explore back roads and narrow tracks on a half-day mountain bike tour of Krabi’s countryside. Leave the city behind for small fishing and farming communities, and pedal through tranquil valleys beneath soaring cliffs. Climb into verdant hills and descend along winding single track, pass unspoiled forests home to thriving monkeys and vivid birds, and discover Krabi’s astonishing landscape at your own pace. This 3 days and 2 nights Khao Sok safari takes you on 3-hour trekking into the heart of Khao Sok National Park followed by an overnight stay in a jungle bungalow. On the second and third day you will float down the Khao Sok River, explore Cheow Lan Lake by longtail boat, visit Pra Kay Petch Cave and sleep in a rafthouse on the lake. Located in the lush jungle, this tour is ideal to discover the wild land of Krabi region. Kayak ride through the mangrove area, swim in natural pools under the limestone cliff and places to photograph spectacular panoramas.